Do you ever read a book where at the end you really wish you knew what was going to happen to one of the supporting characters? That is exactly how I felt about Lenora when I read The Vicar's Daughter, and I was so happy when I heard that she would get her own book. Kilpack writes excellent stories, and I love what she did with Lenora's book. Lenora's family had coddled her, and their attentiveness, although well-intentioned, forced her to stay in the brittle mold that encased her. The change we got to see in Lenora while she lived with her aunt in Bath was wonderful. I was so surprised at her midnight walks (especially her attire), but I loved it. She kept reverting back to her anxiety and self-doubt, but I loved how much she had grown at the beginning of the story, and then how much more she grew throughout. I really enjoyed the characters in this novel. None of them fit the mold society would have them fit in, and it was so entertaining to see them mesh with each other. Miss Wilton's Waltz has depth and plenty of emotion. There were a few times when I was a little impatient for things to work out, but overall it was a great read. I can see myself reading this one again. I am so glad Lenora got a story! She really took an emotional beating in A Vicar's Daughter, so I was happy to see this book come out. I can relate to Lenora in several ways. Painfully shy, uncomfortable in crowds or being the center of attention, needing to escape the chaos of life to be alone. These all resonated with me. It is so sad to me that she was tempting scandal by simply going on a walk at night. I love Regency novels, but I'm sure glad I don't live in that time period. I kind of expected Miss Keighly to be more villainous than she was, for no other reason than...well, I don't know why, actually. But in a way I'm glad she wasn't. It made the difficulty of Aiden and Lenora's situation that much more realistic. This is not a fast-paced story, but it still drew me in right away. I had to force myself to put it down for a while so I could actually get stuff done around the house. I was worried about this story when I first started even though the synopsis sounded really interesting, and the cover is lovely. I was hesitant to pick it up, although I shouldn't have been. It's a great story. I will admit I was a little confused at the beginning trying to figure out who was who. I didn't realize this was a story following The Vicar's Daughter. The characters seemed familiar to me, but it took me a minute to figure that out. If you haven't read The Vicar's Daughter, you will be just fine. This story can stand on it's own two feet (although if you have any plans to read The Vicar's Daughter, I highly suggest you start with that one just to avoid spoilers). This story pulled me right in and I was cheering for Leonora to find out who she really was, instead of who her family thought she was. I think it takes a lot of courage to try and figure that out so I was applauding her through the entire book. Catherine I wasn't too sure if I liked. I felt her her and her situation, but the way she treated people made me sad. I'm glad that Aiden seemed to understand her and do what he could to help. Poor Aiden. Always trying to do what's right but never quite getting it right. 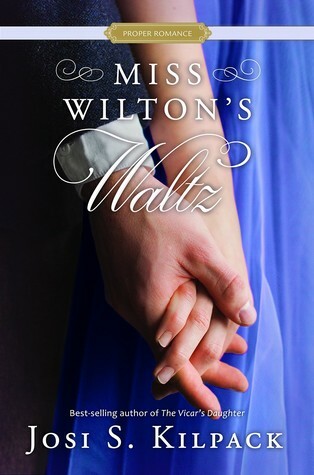 If you are looking for a good clean regency to read, definitely give Miss Wilton's Waltz a try.